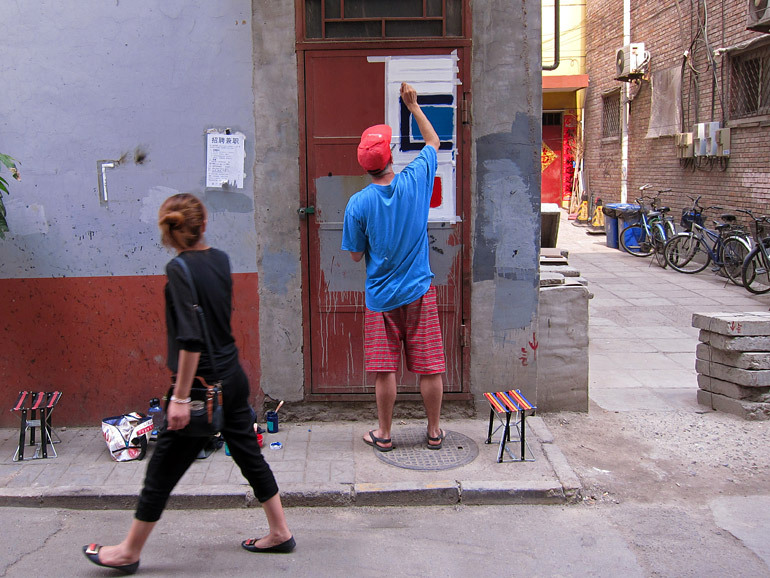 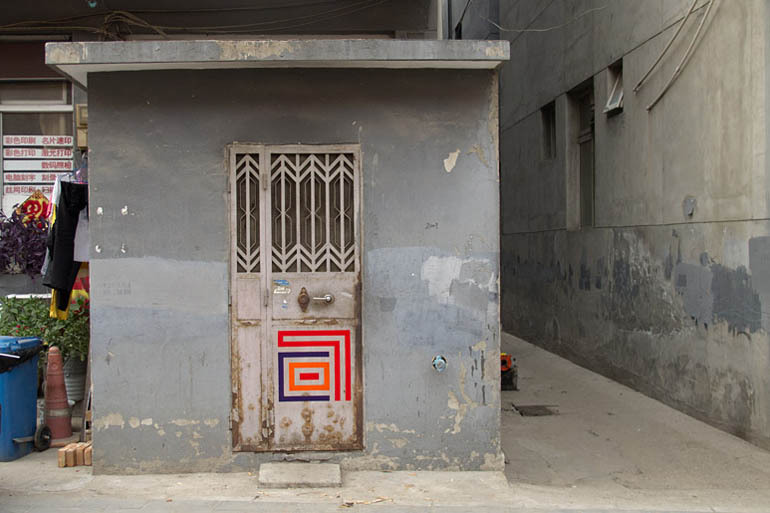 The 1/1 project aims to bring contemporary art to the street and the street into the gallery. 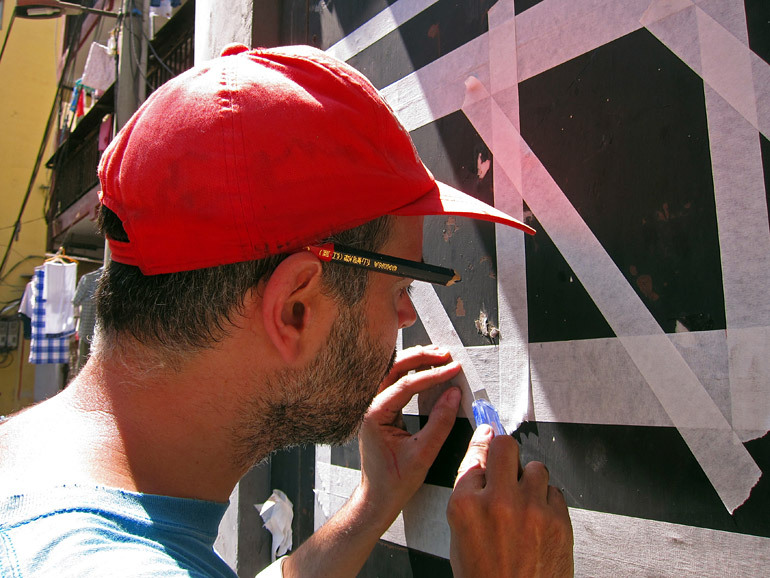 Bringing art to unexpected places has been the goal of this French artist since he started painting abstract geometric figures in the street back in 1999. 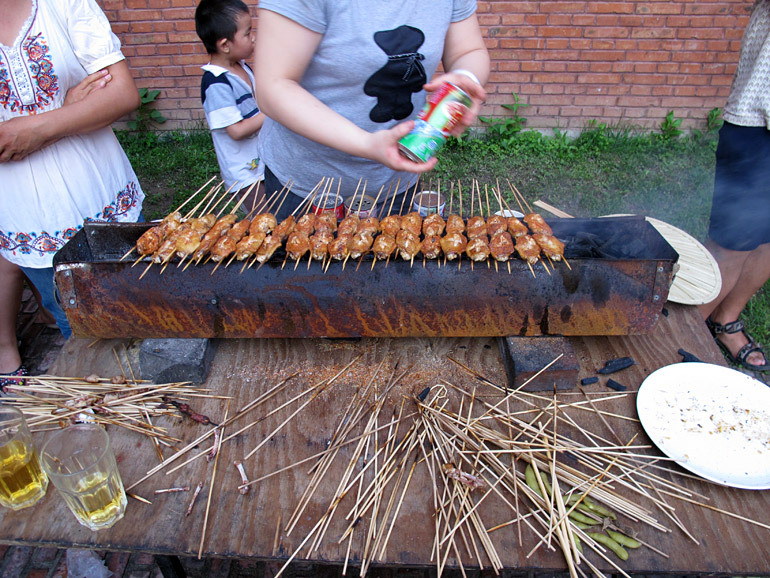 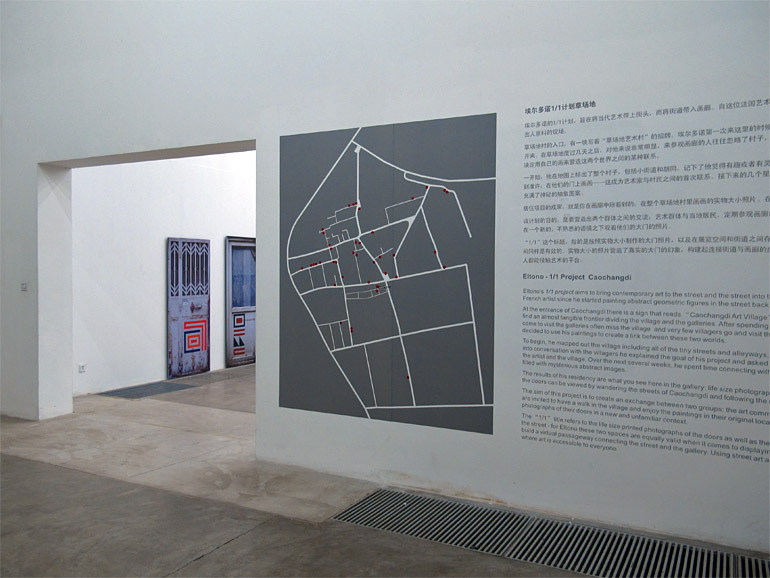 At the entrance of Caochangdi there is a sign that reads “Caochangdi Art Village”. 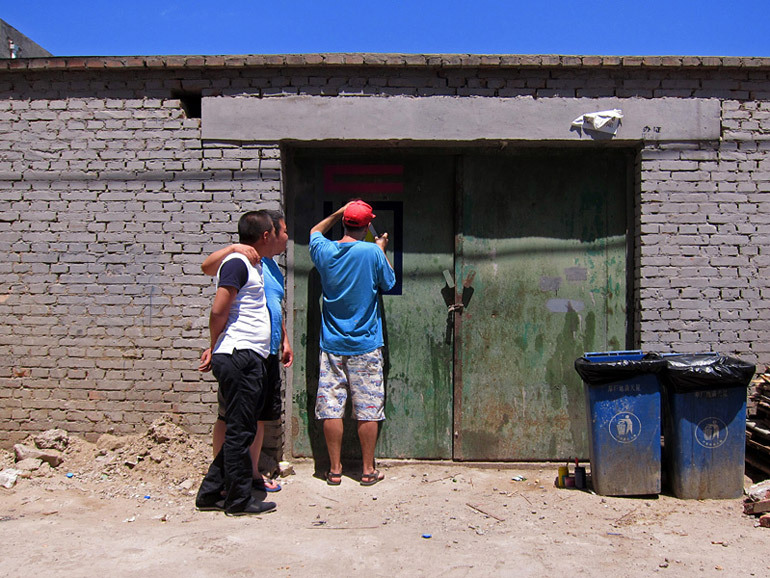 However, when Eltono came for the first time, he was surprised to find an almost tangible frontier dividing the village and the galleries. 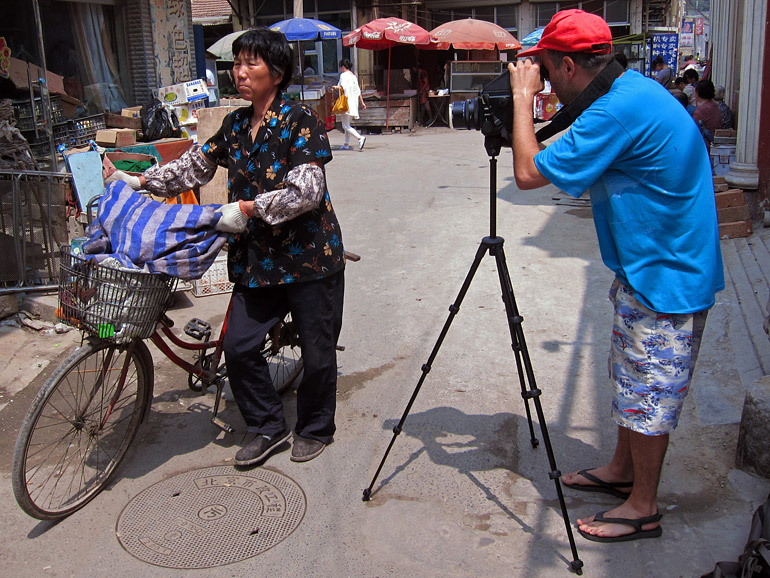 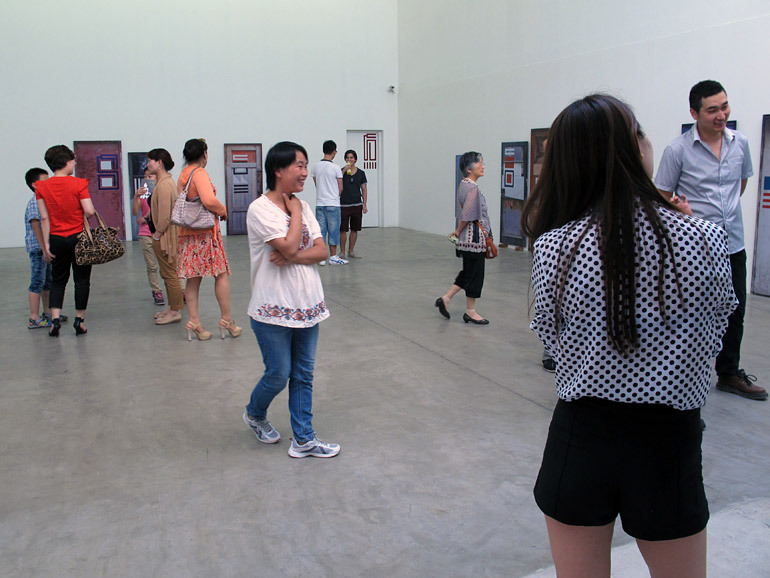 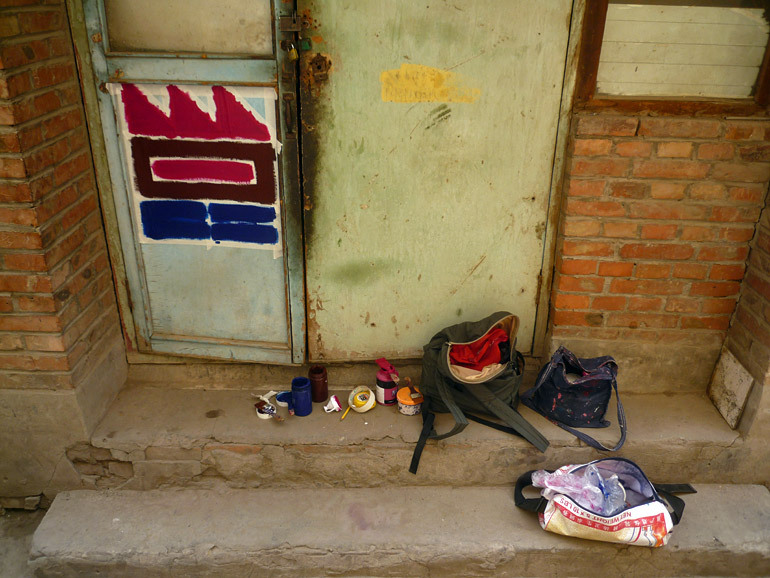 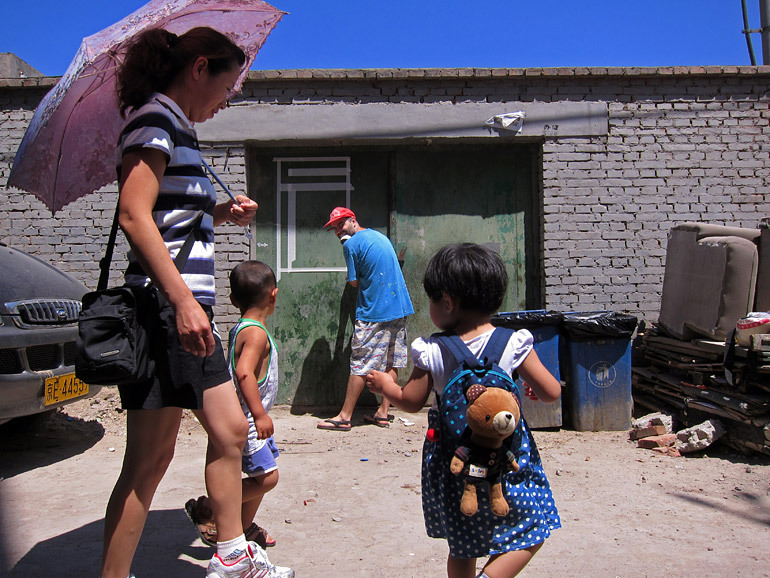 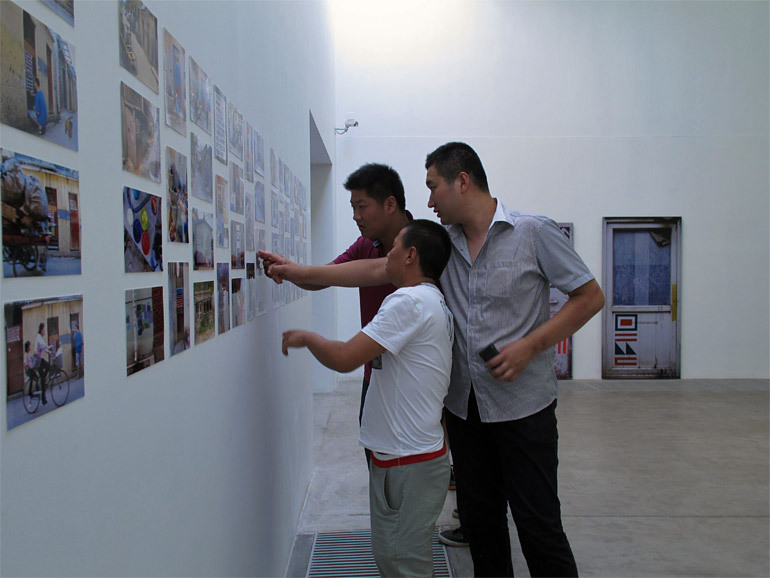 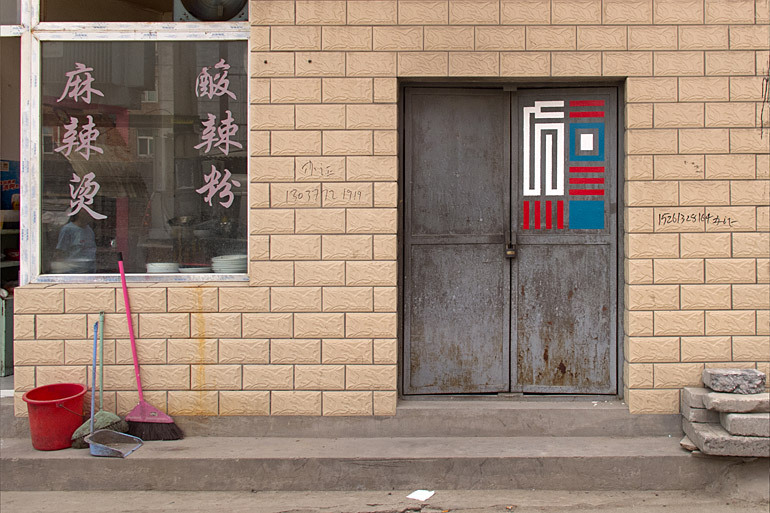 After spending a few days in Caochangdi it became clear to him that the people who come to visit the galleries often miss the village, and very few villagers go and visit the art galleries. 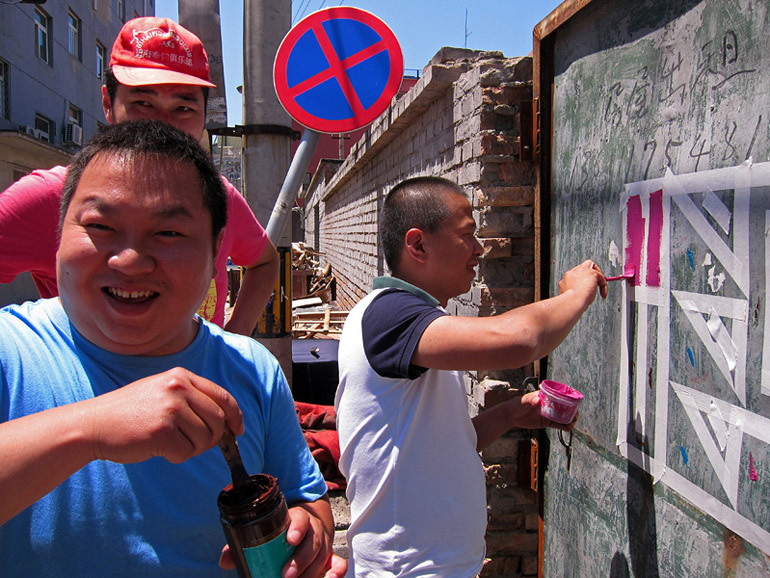 During his one month residency in Caochangdi, Eltono decided to use his paintings to create a link between these two worlds. 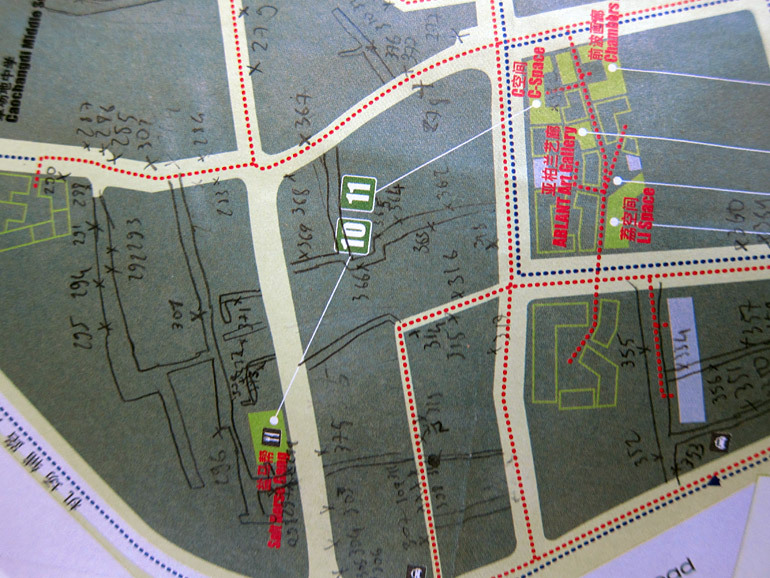 To begin, he mapped out the village including all of the tiny streets and alleyways, noting down all the doors he found interesting or inspiring. 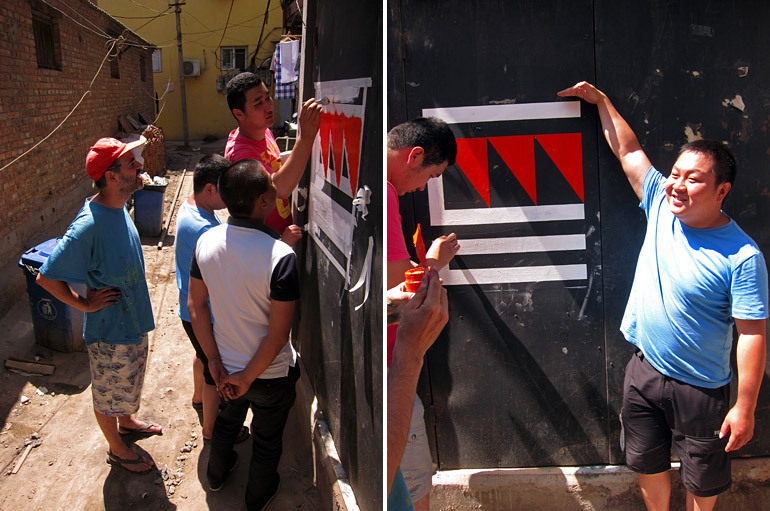 Entering into conversation with the villagers he explained the goal of his project and asked permission to paint their doors – this served as the first link between the artist and the village. 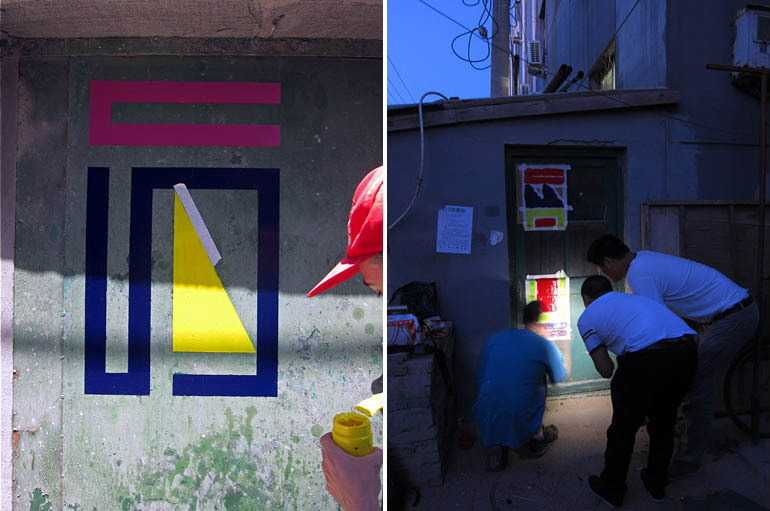 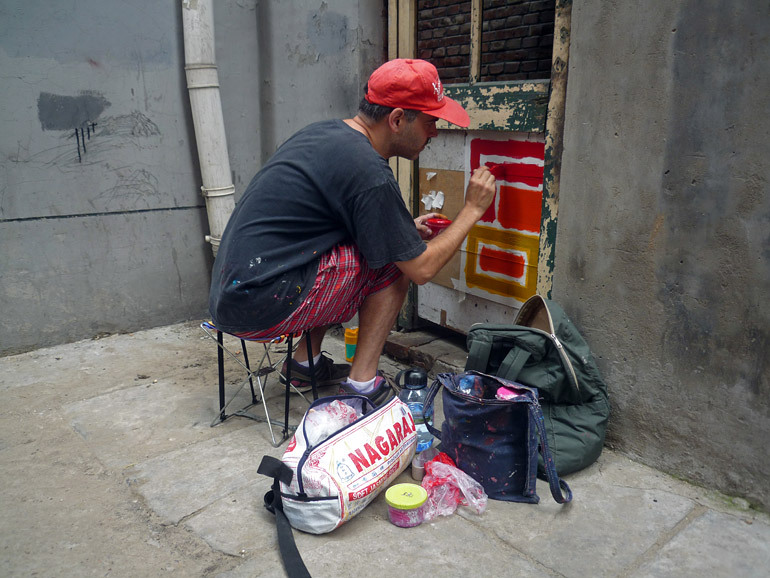 Over the next several weeks, he spent time connecting with residents and painting, creating a path throughout the neighborhood filled with mysterious abstract images. 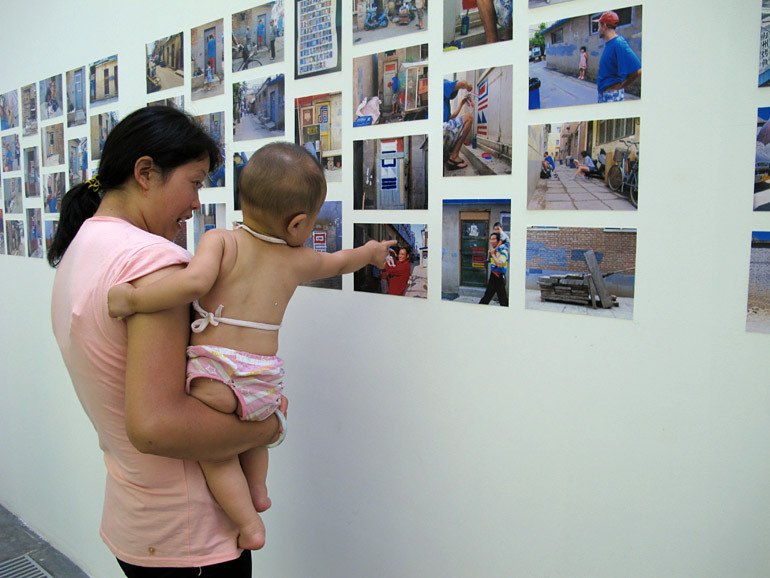 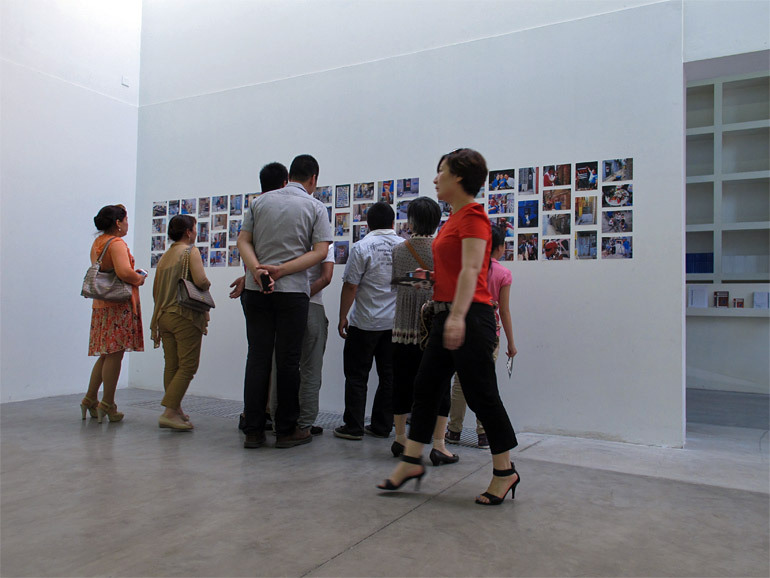 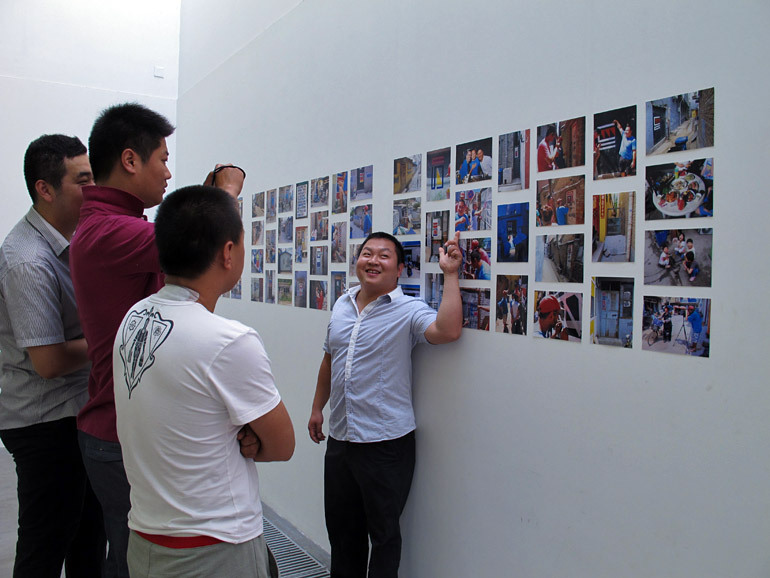 A selection of life size photographs, the result of Eltono’s residency, were on exhibit in C-space gallery until the end of August, 2012. 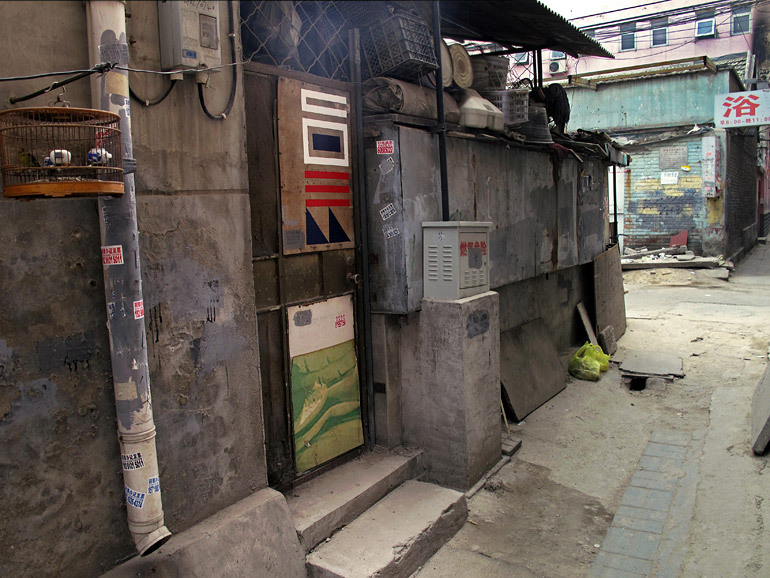 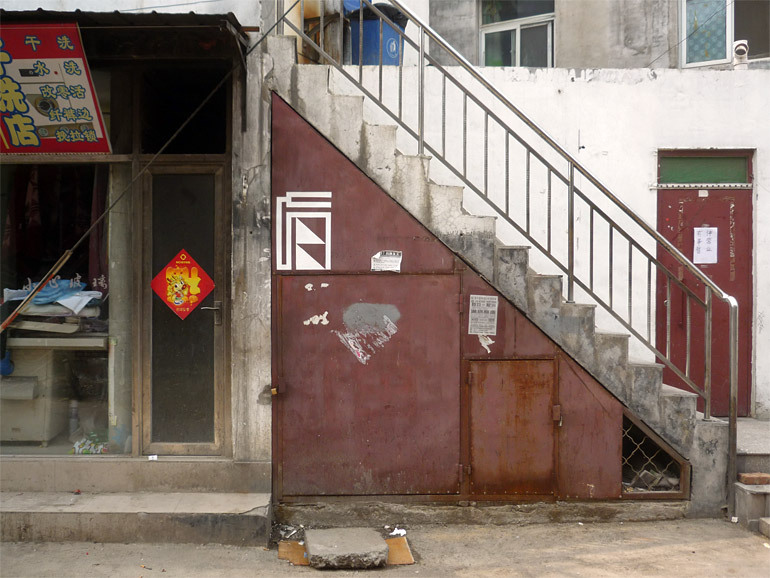 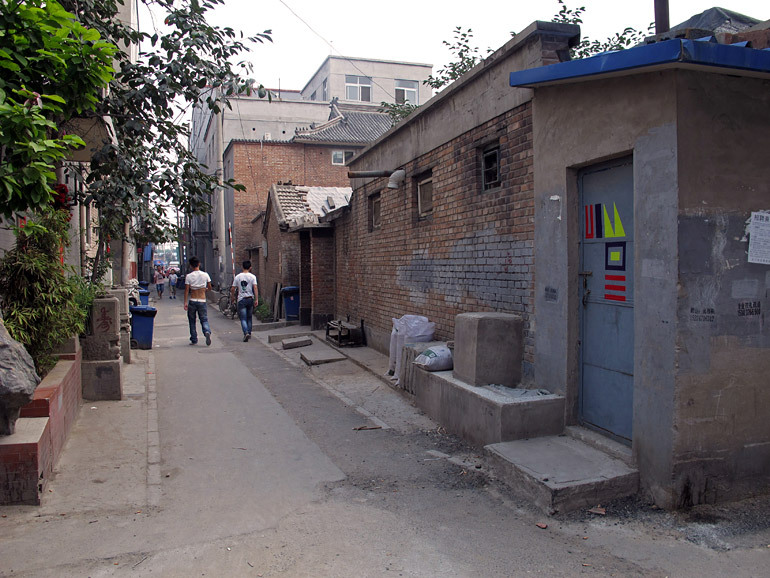 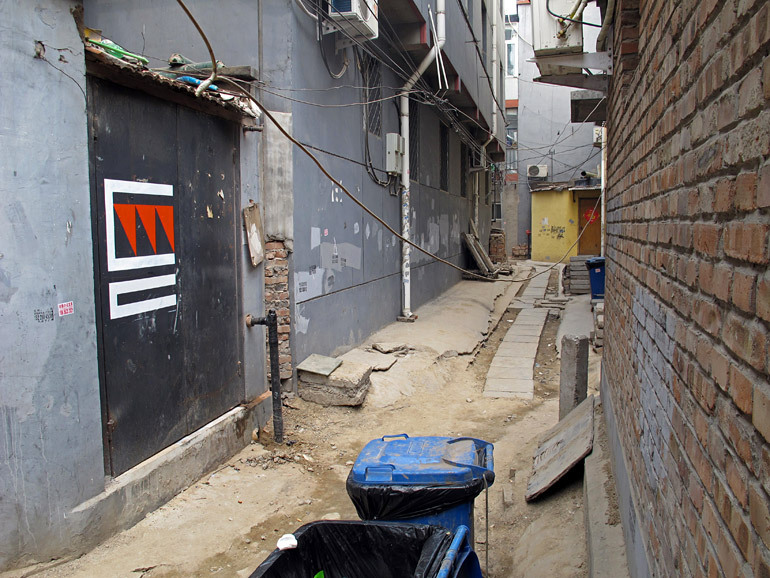 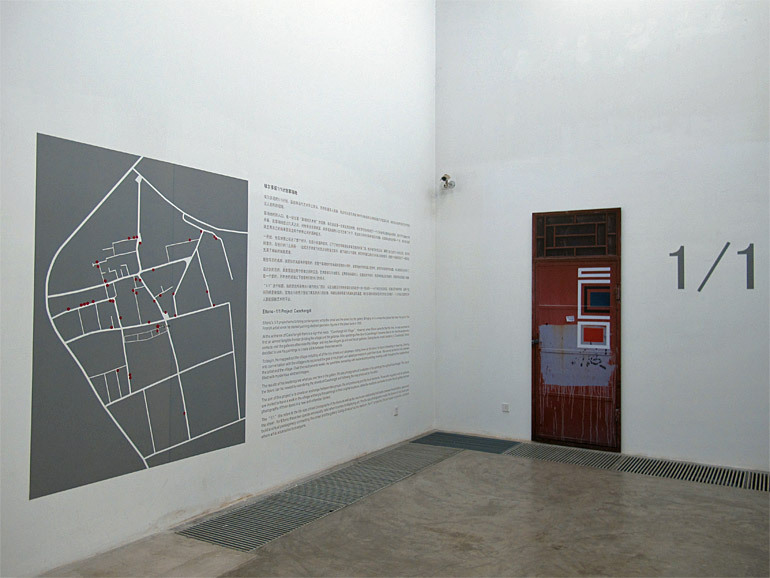 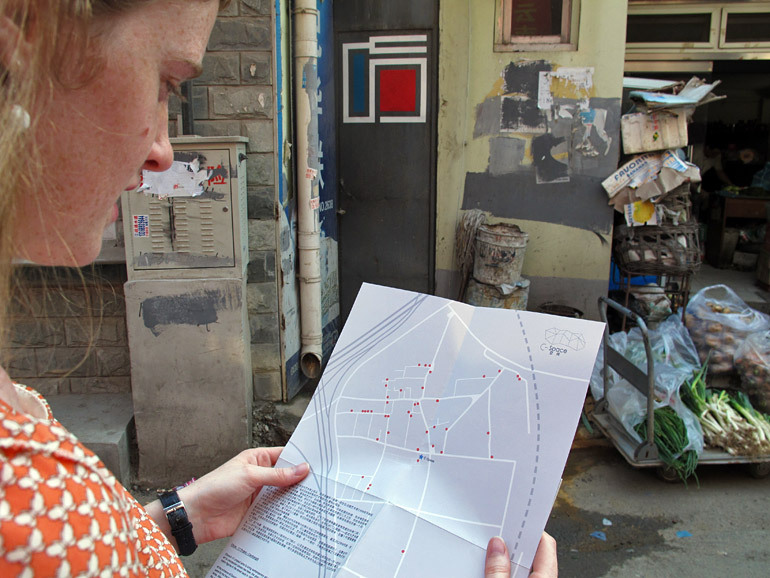 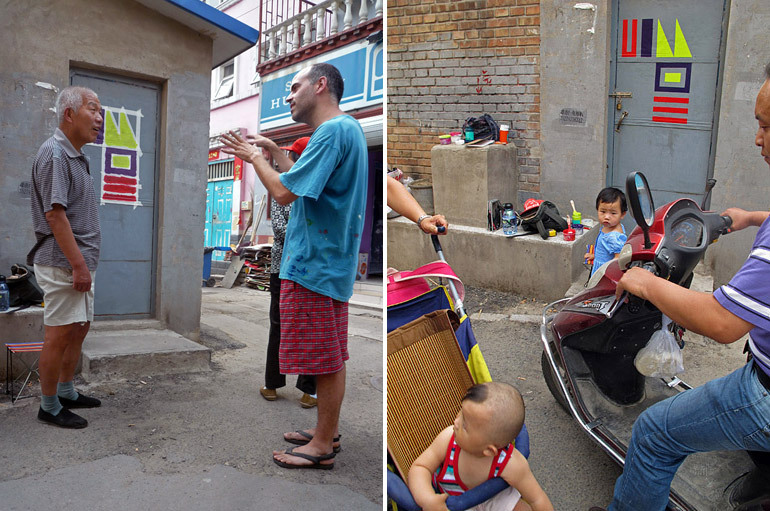 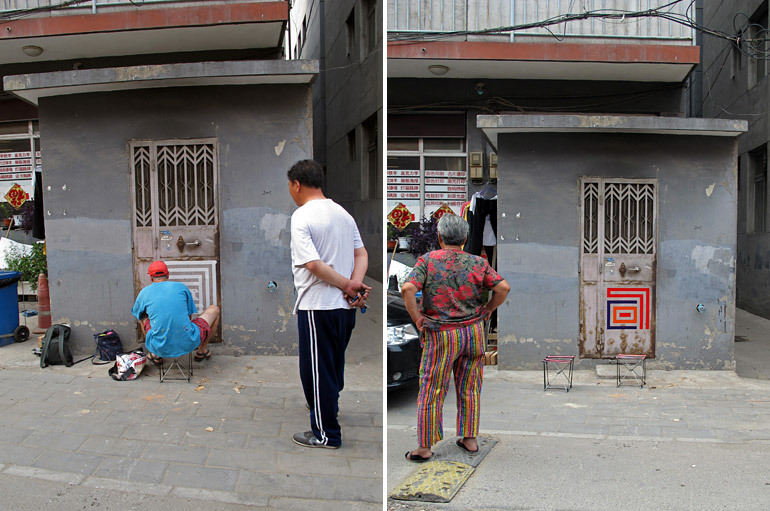 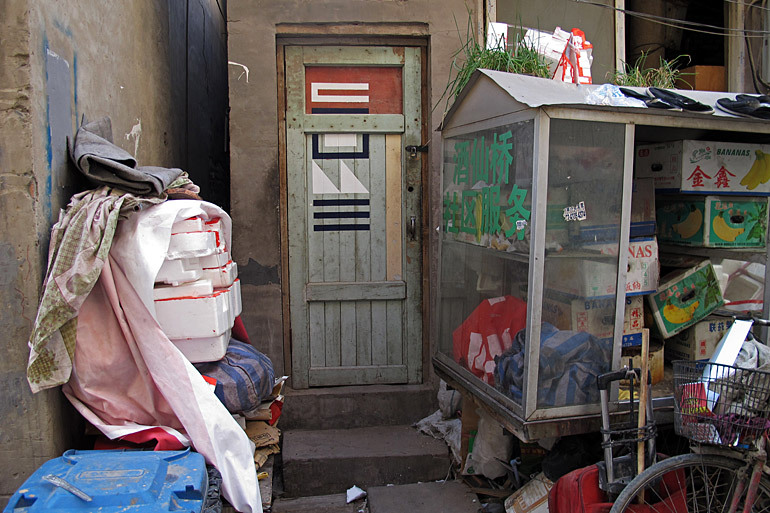 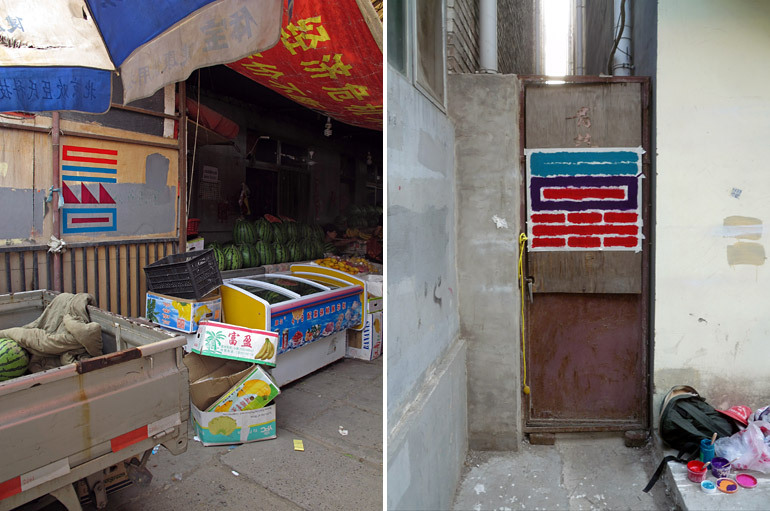 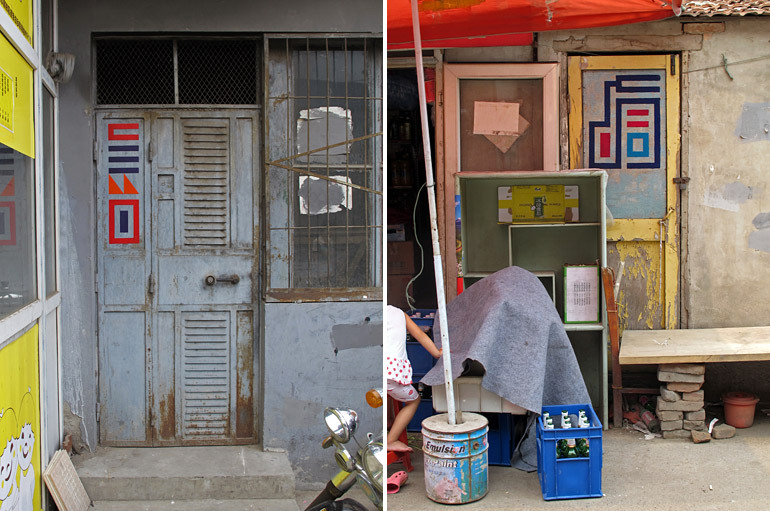 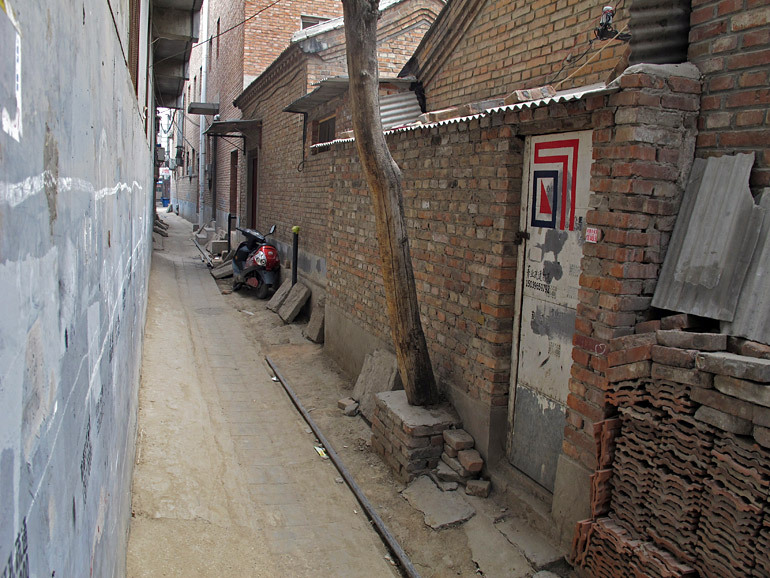 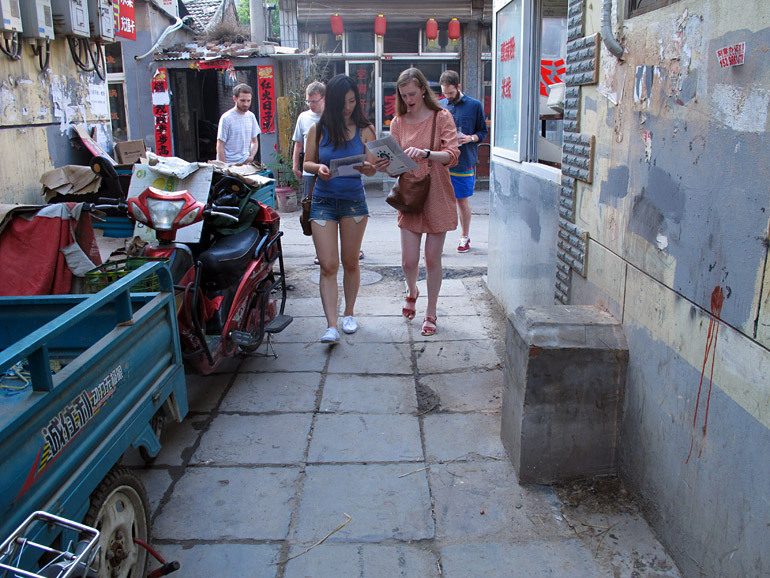 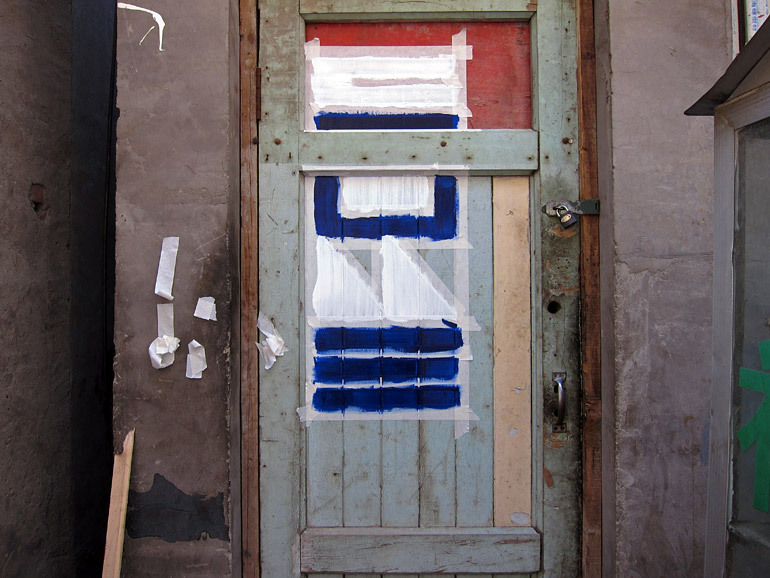 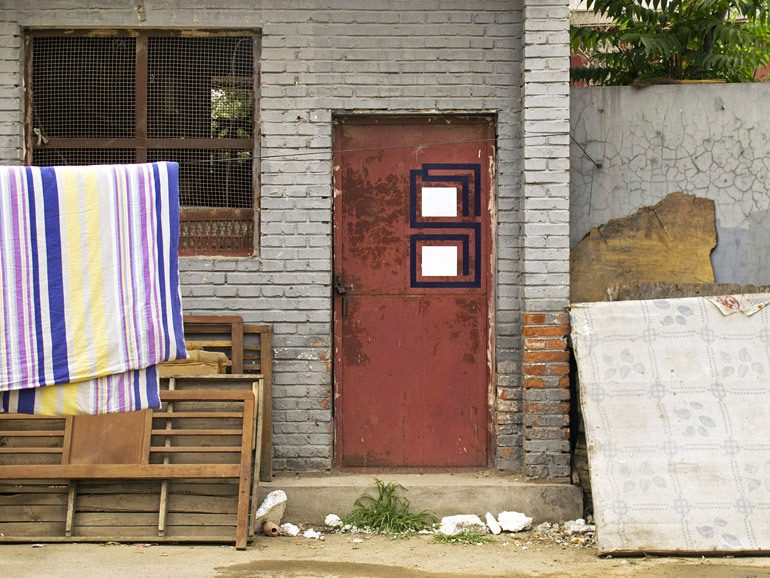 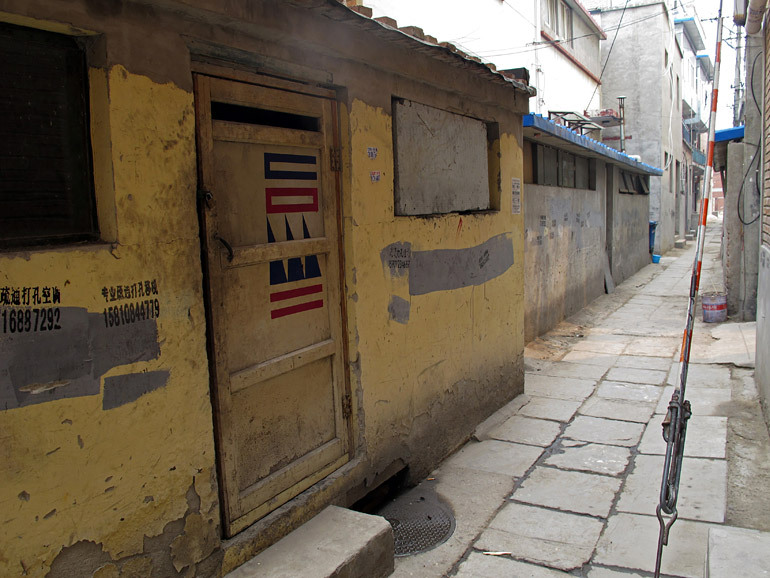 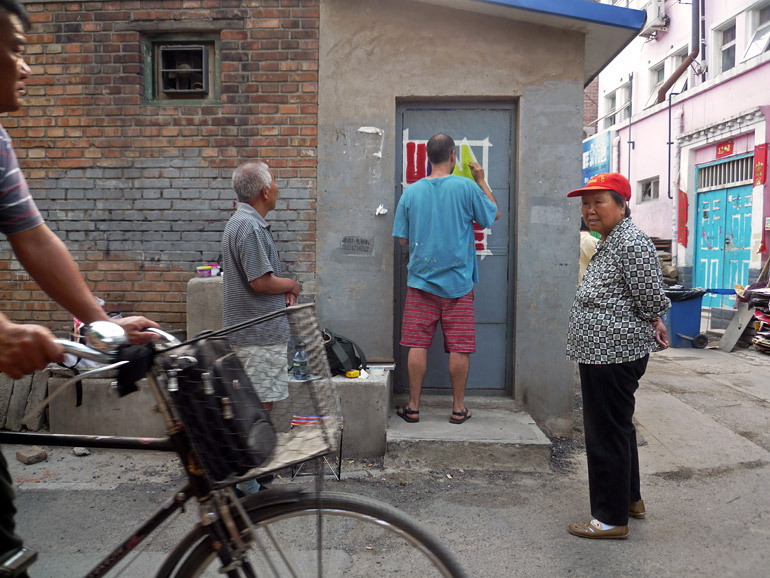 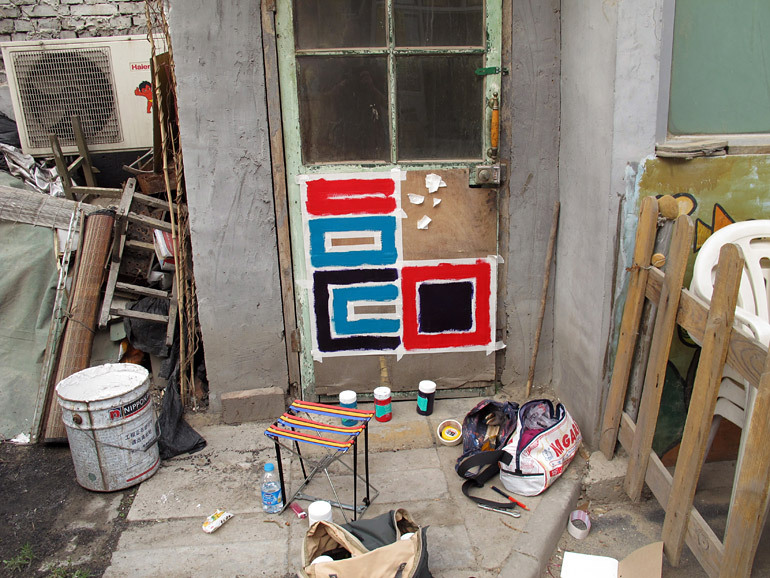 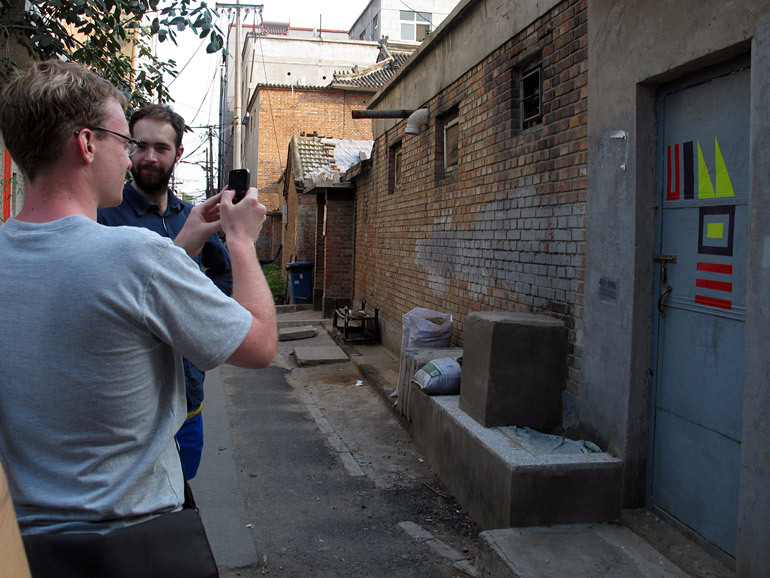 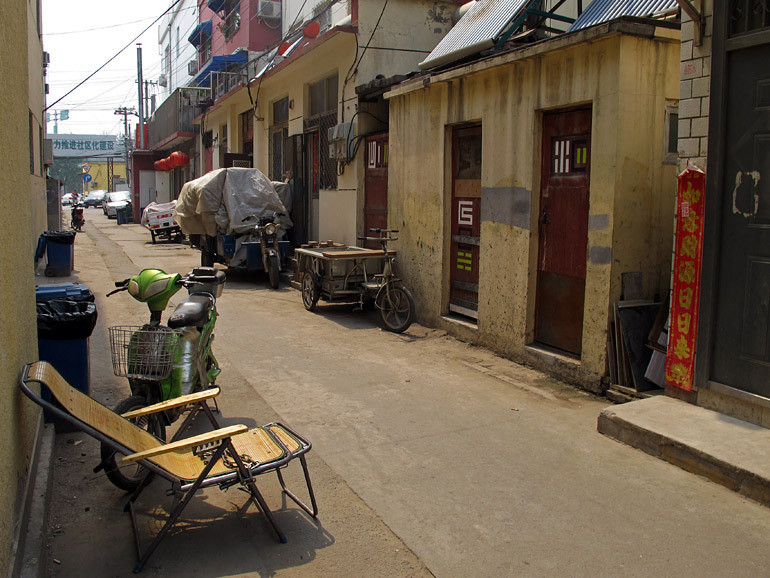 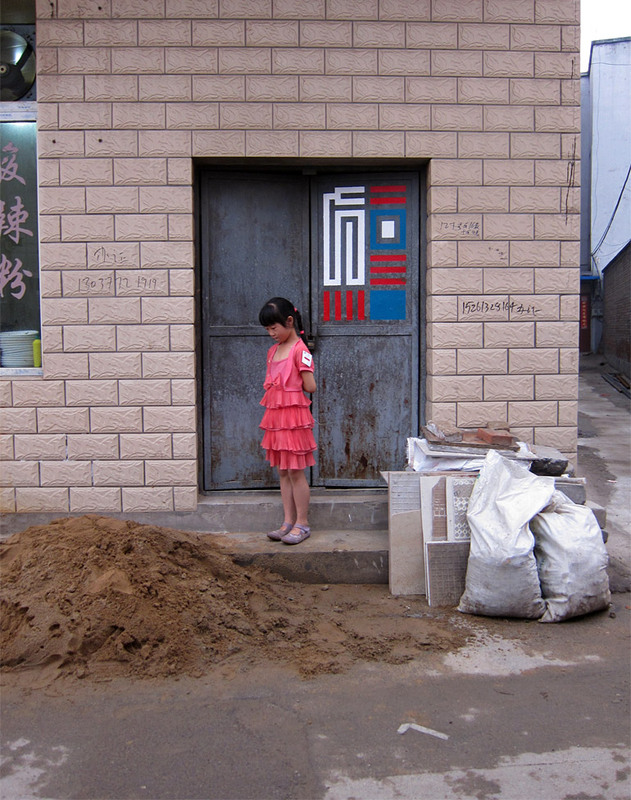 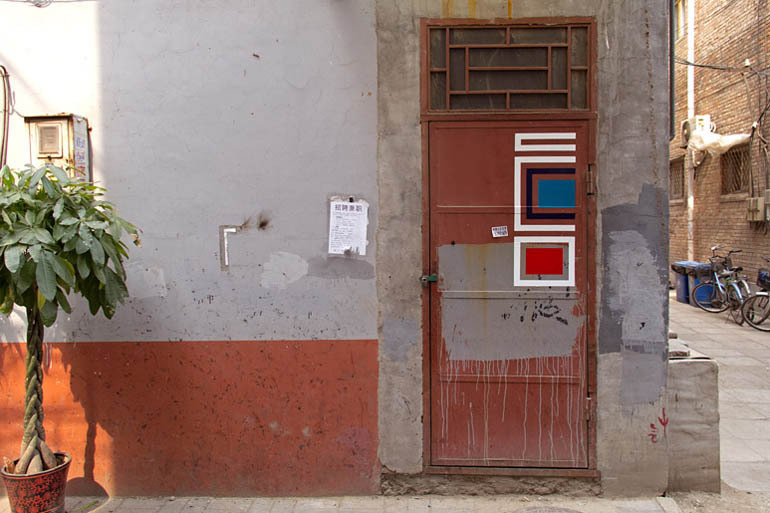 The rest of the doors can still be viewed by wandering the streets of Caochangdi and following the map produced by the artist (downloadable here). 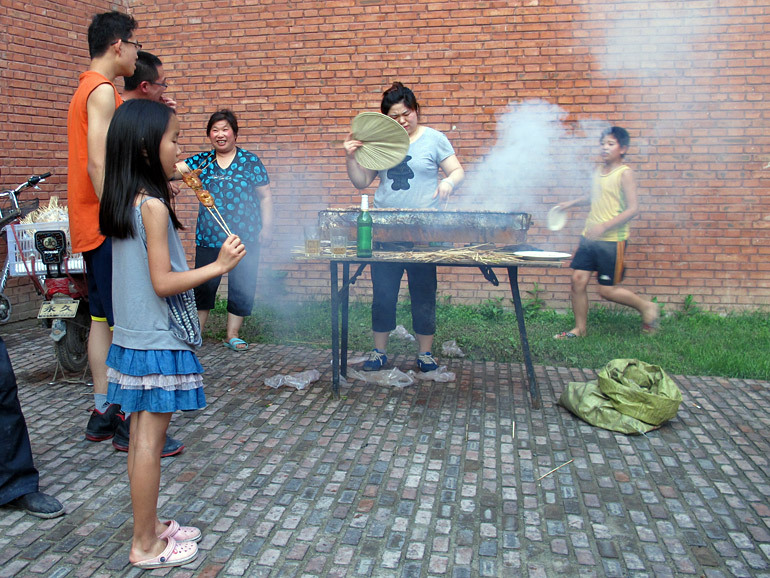 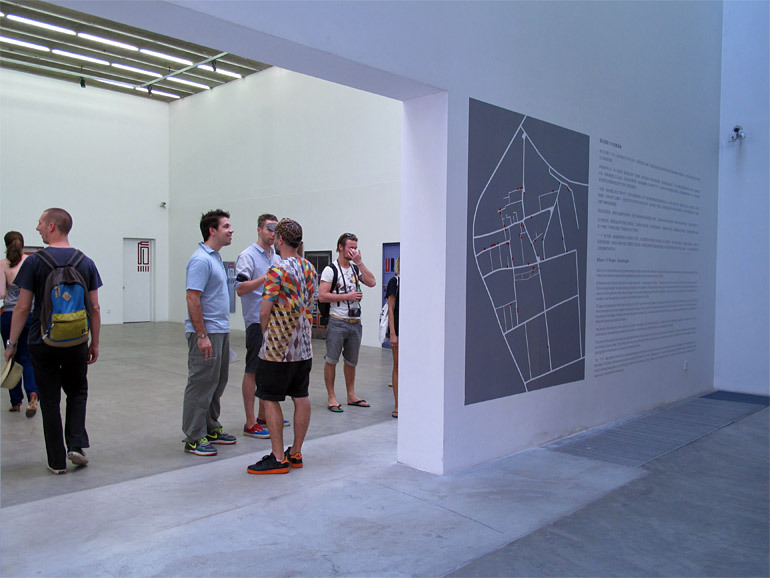 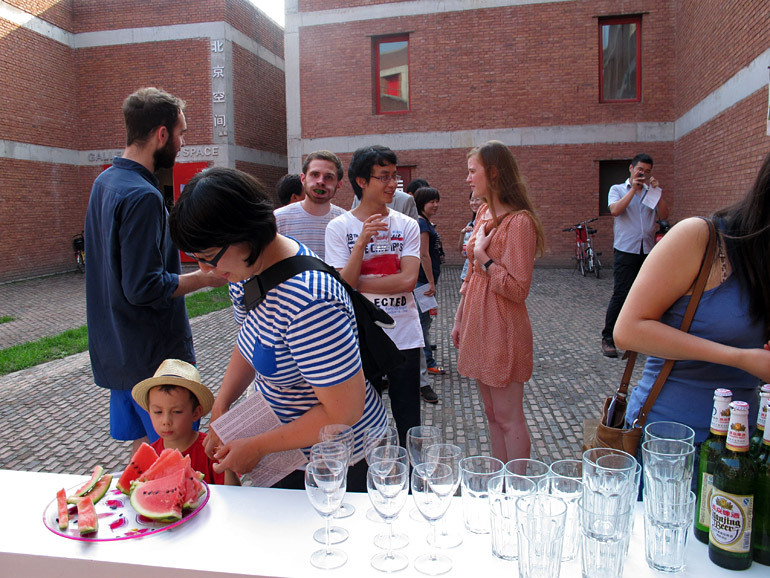 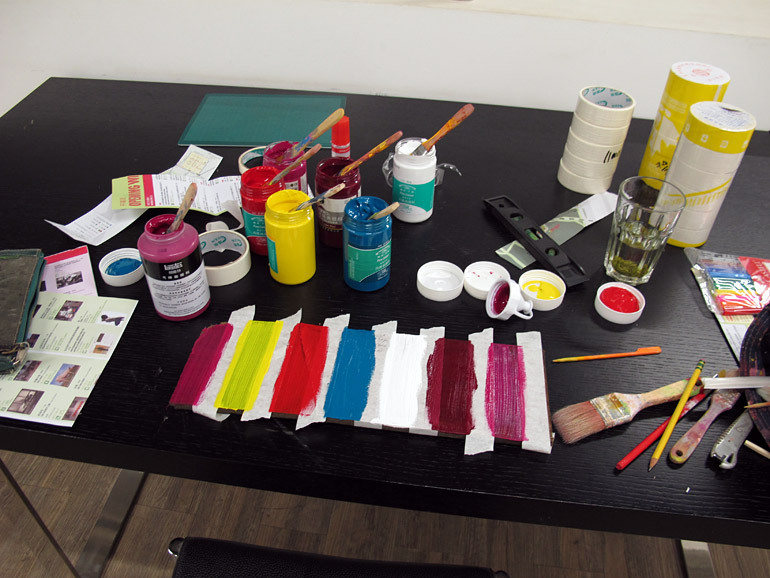 The aim of this project is to create an exchange between two groups: the art community and the local residents. 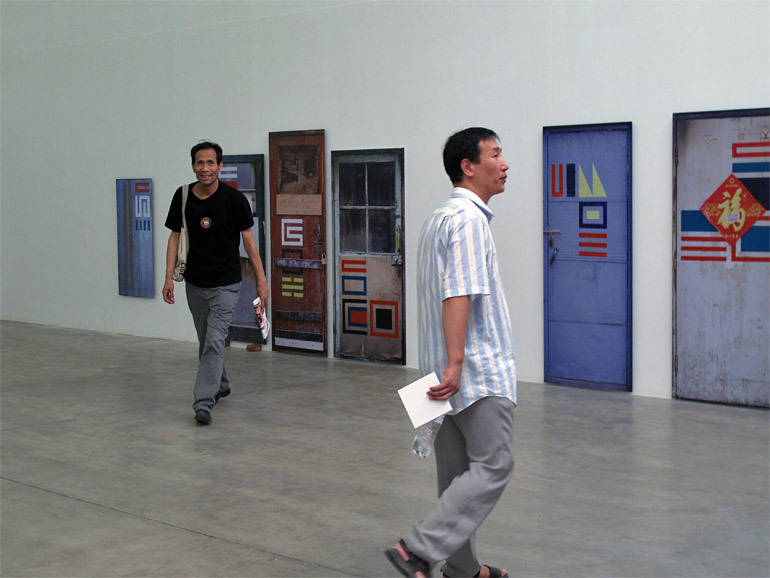 Those who regularly visit art galleries are invited to have a walk in the village and enjoy the paintings in their original locations, while the residents are invited to enter the art gallery and see photographs of their doors in a new and unfamiliar context. 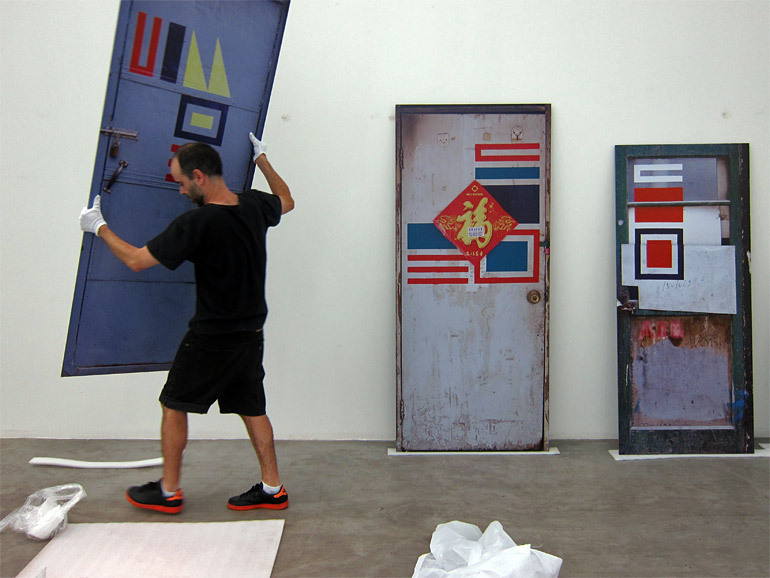 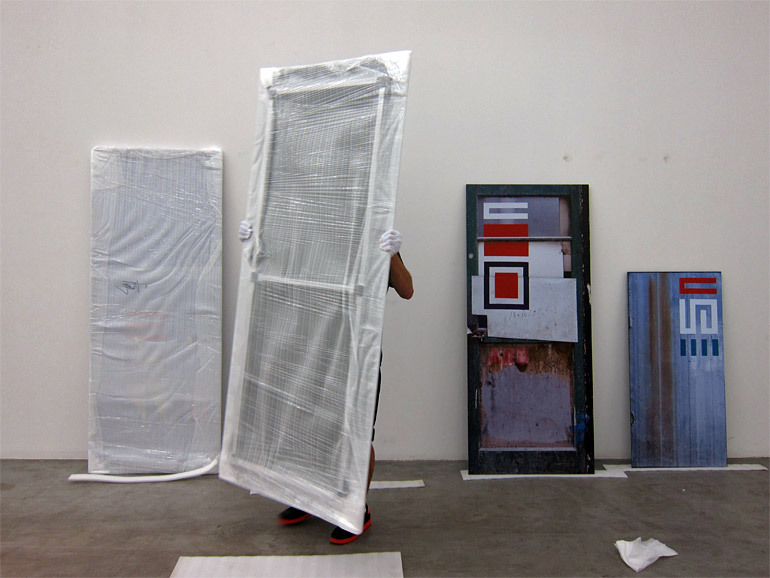 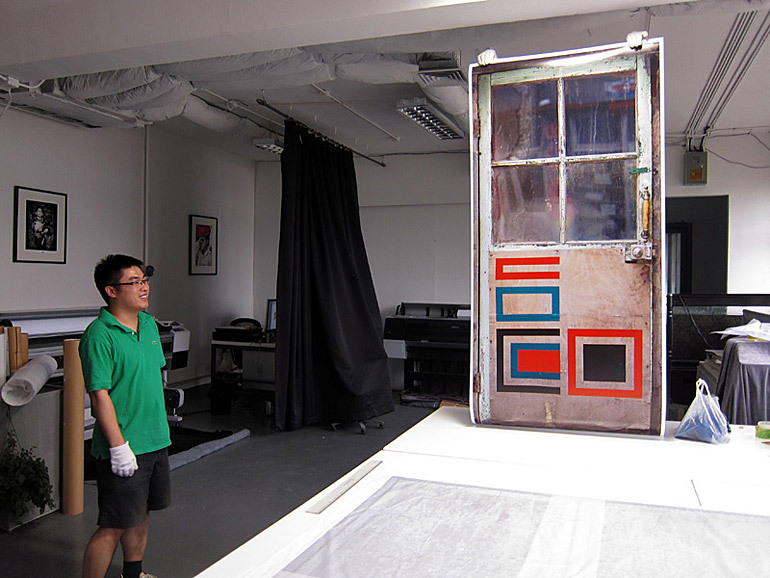 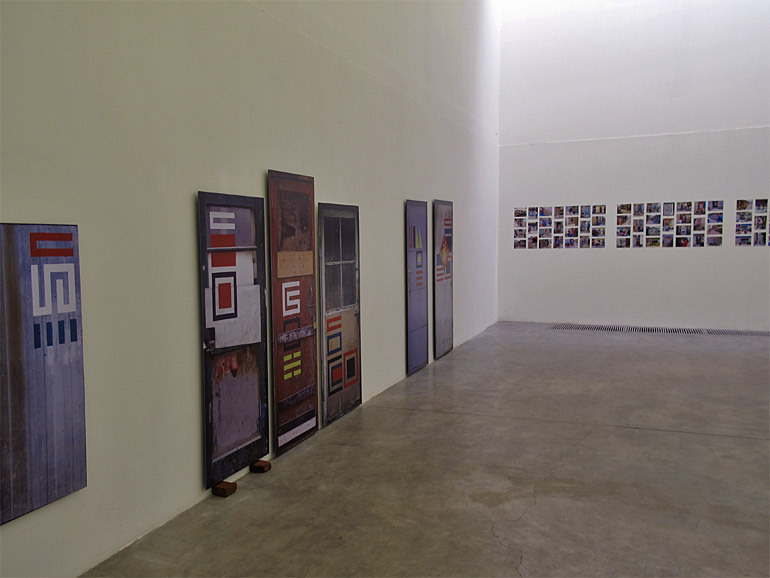 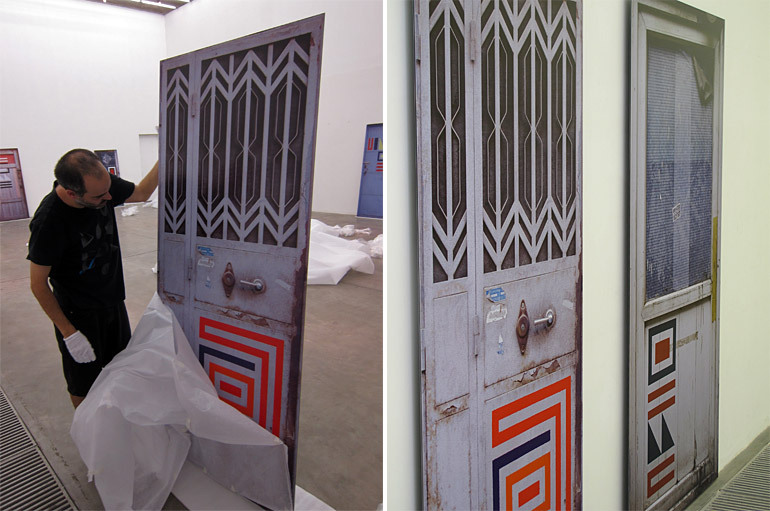 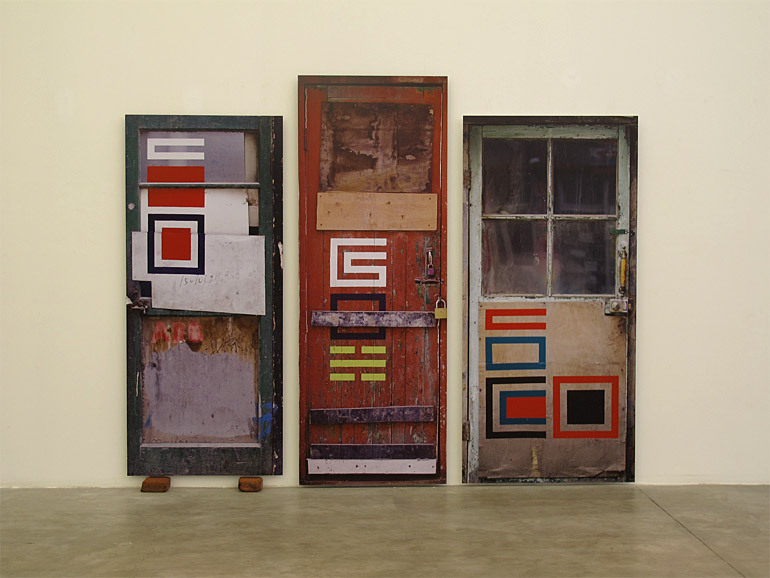 The “1/1” title refers to the life size printed photographs of the doors as well as the one to one relationship that exists between the exhibition space and the street – for Eltono these two spaces are equally valid when it comes to displaying art. 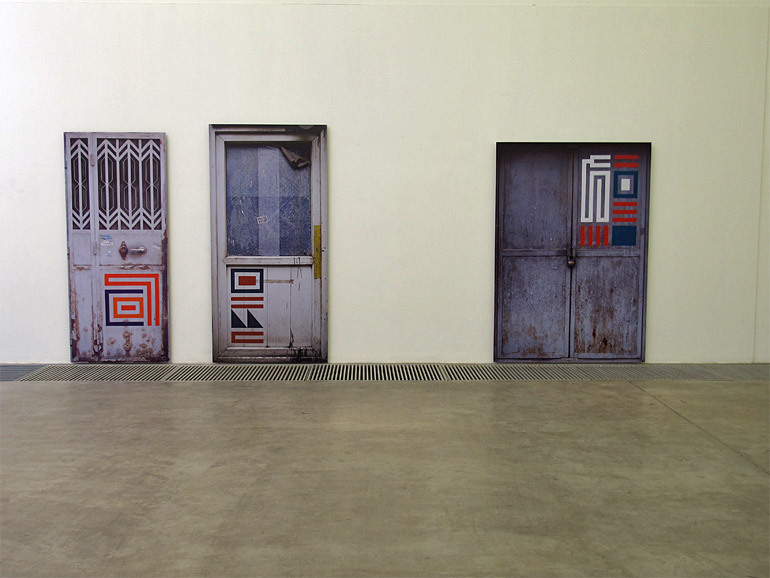 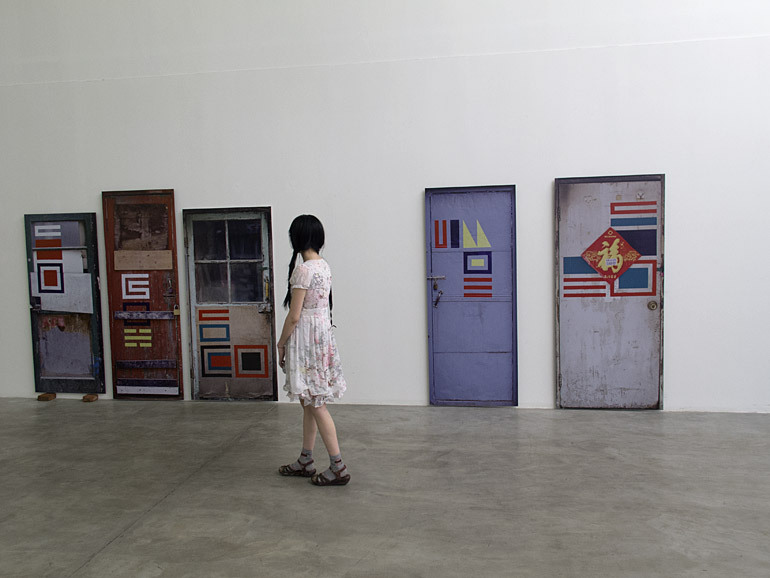 The life size photographs create the illusion of real doors and build a virtual passageway connecting the street and the gallery. 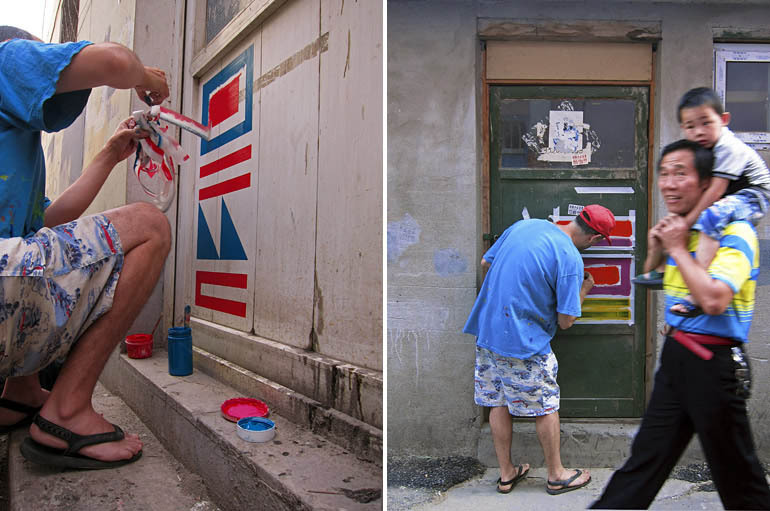 Using street art as his medium, the 1/1 project by Eltono hopes to provide a platform where art is accessible to everyone. 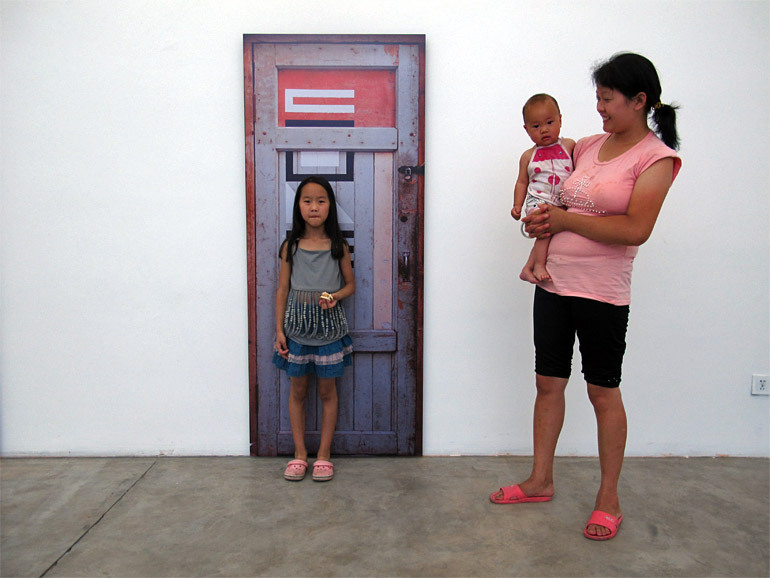 The life-size door photographs are available for purchase through the gallery. 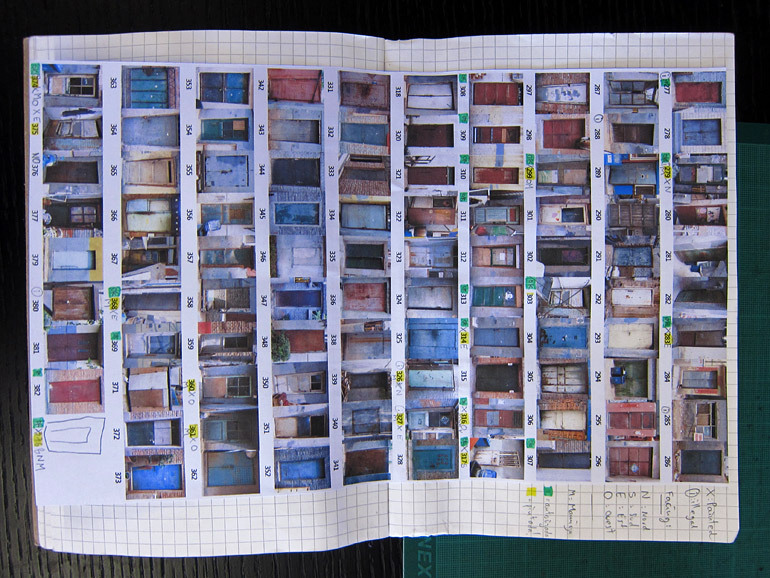 Each photo is unique and numbered 1/1. 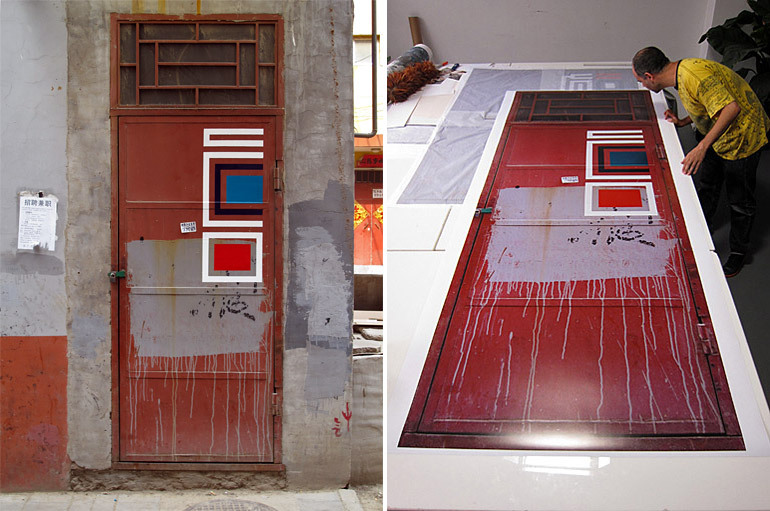 The pictures were taken with a 6×7 medium format argentic camera and printed with giclée technique on high quality photographic paper. 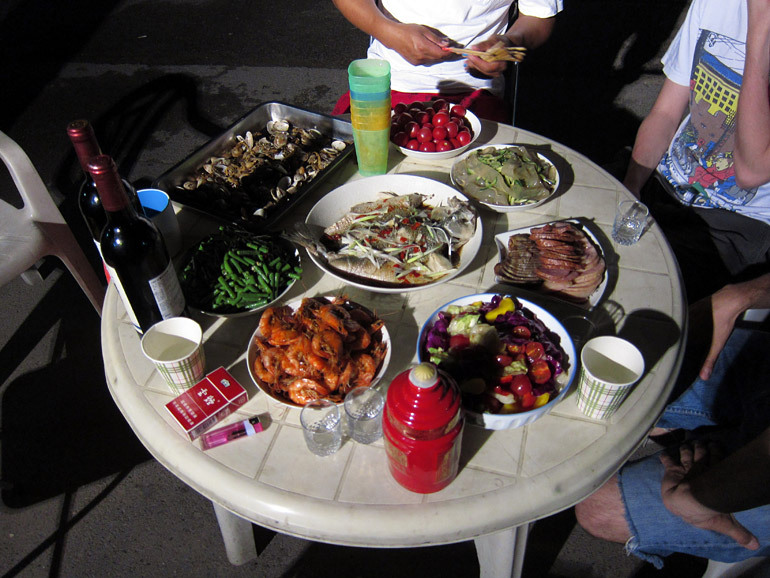 Photos by Sierra and Eltono. 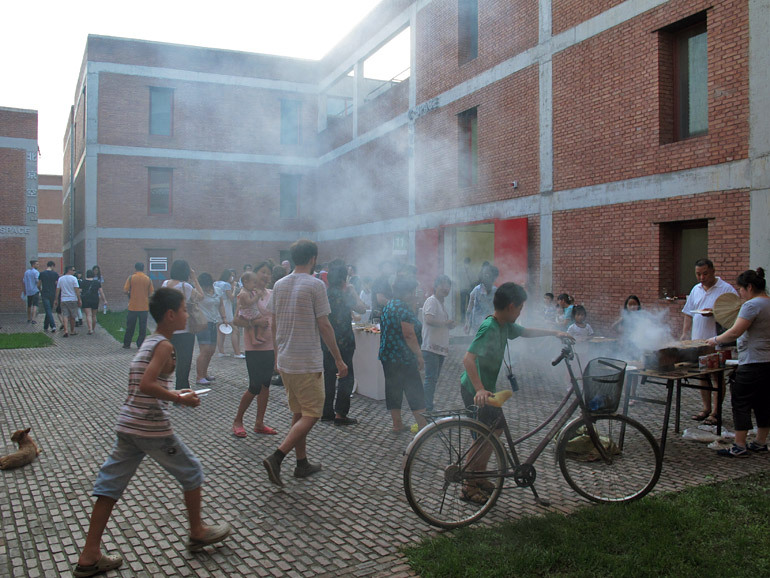 Thanks Melle, Nora, Wangfan, Lina, Cindy, Liugang, Angela & Aitor, Sierra, Alonso, Jacob, Elisa and of course: Xinkai, Haizi, Maomao, Caochandi Number 1 and all the residents of Caochangdi.